Hilary Duff’s last studio album was 2007’s Dignity, an impressive dance-pop record that was almost entirely co-written by Hilary. It was her third album – not including her Christmas record and hits compilation – and marked a clear change in sound compared to her previous efforts. Dignity was praised by critics, but unfortunately the album did not have great sales. Hilary released a second greatest hits compilation – Best Of Hilary Duff – in late 2008, and not much else since then. Aside from her movie soundtrack song, “Any Other Day,” Hilary Duff has not released any new music in years. Her anticipated fourth studio album has been long awaited, and in the works for nearly as long. In 2014, Hilary released two new singles. “Chasing The Sun” was her laid-back buzz single, while “All About You” was the more pop first single. Since their releases, Hilary spent the last few months of the year filming for a new TV show called Younger – it will premiere in March 2015. Hilary returned to the studio in January 2015 – this time in Sweden, and with hit maker Tove Lo. Within two months, Hilary assured fans that the album was done and a single was coming soon. “Sparks” was the new single, and was released on April 7th. On May 15th, Hilary confirmed that her new album would be called Breathe In. Breathe Out., and it was set to be out on June 16, 2015. Breathe In. Breathe Out. was a welcome return to music for Hilary Duff, and despite the 8 year break between albums, it was one that showed growth in Hilary’s writing and singing. The album was even better than fans may have hoped for, and exceeded sales expectations in its opening week, debuting in the top 5 on the Billboard 200 charts. Breathe In. Breathe Out. takes the listener through the ups and downs of life, all the while maintaining a positive energy and quirky lyrics. Songs like “Confetti,” “Tattoo,” “Lies,” and the title track are standouts on the album, while the bonus track “Outlaw” was worthy of standard-edition inclusion. Every song on the album is amazing, and overall Breathe In. Breathe Out. is an impressive pop album that stands as perhaps the best that Hilary has released yet. I sing in my car so much and we always have music in the house. I think he really likes it. I just recently started taking vocal lessons again. I want to eventually make another record. It just seems like a good time because I’m sitting idle a little bit. I feel very lucky to be able to not have to work during this pregnancy. I’ve been painting a lot and cooking and we’ve moved and I exercise all the time. And I’ve just been able to be me and be calm and really mellow during this time, and try to enjoy the peace and quiet. But I was also like I don’t want to waste this time because I want to get my voice in shape. He kicks me. Two months later, in January 2012, Hilary entered the studio. She worked with Matt Squire and Ali Tamposi as she wrote and recorded material. Had a great session with @HilaryDuff and @alitamposi. Amazing hang. Amazing song. I must say, I can't get our song outta my head @Hilaryduff @matt_squire !! Lovinnn it!!! Based on the excited tweets above, the music was going well and was shaping up to be a great record. Hilary slowed down once her son Luca was born in March. She had meetings in June 2012, and returned to the studio in July to record more songs. She revealed that she wrote a new song in August 2012… and then there was nothing. Months passed with no updates from Hilary on the progress of her new music. It wasn’t until an interview in April 2013 that she announced that she had the “itch” to get back to new music. That was over a year back when I was just not talking about it, but wanting to flex my muscles again in the studio. That sound isn’t really where I want to go. Although she doesn’t specify what her work with Matt Squire, Ali Tamposi, and Martin Johnson sounded like, based on the co-writers’ previous work, it may have been a pop-rock style akin to that of Avril Lavigne or Kelly Clarkson. Instead of continuing from this, Hilary revealed a different direction: Dance with a focus on lyrics. I’m super into EDM. I have a big long list of people I want to work with and a pretty clear direction or where I want to go. My music has always been very lyrically driven. I care so much about that. So that’s my only thing. There are so many artists that I love but I’m like, ‘I can’t connect to that, so I don’t really know what it means.’ It’s too abstract for me to follow. I can still sing along and love it, but I’m not totally stuck on it, because I’m really attracted to lyrics. I want to keep that in the back of my mind. Late 2013 marks the true beginning of Hilary Duff’s new album. Since this important interview, Hilary has shared quite a bit about the recording process, including song titles, lyrics, and behind-the-scenes photos. Just the next day, on September 24th, Hilary shared a photo of her first day of recording. According to the caption, the song was called “Better Days,” and was done with Billy Mann. crazy session today w/ Hilary Duff and Lindy Robbins! Only one day later, another song title surfaced. In a paparazzi photo of Hilary outside of the recording studio, the paper in her hand clearly shows the title. Could this be a new song for her album? Nice to stare at a beautiful tree while working..
On December 4th, Hilary sat down for an interview in Toronto, Ontario. She talked about her new music, revealing that the first 6 songs she recorded were dancier, upbeat, and uplifting. At the point, she was just starting to get into “moodier stuff.” Her album thus far had an indie dance sound, and Hilary announced that she hoped to have a single out by late spring 2014, and an album by fall 2014. You can see the interview below; they begin discussing Hilary’s new music at 2:52. There’s some EDM influence. And then some songs kind of like indie and earthy. I don’t know, that sounds really weird. It’s all over the map. Some songs have really heavy piano. Some have like funky weird tinkering sounds. On December 15th, Hilary continued work in the studio, this time with Mitchy Collins and Christian Medice in New York City. That ended Hilary’s recording for 2013. She took off a few weeks for the holidays before resuming work in January 2014. Was a late one last night at the studio w/ @tearcekizzo and @fransiscahall songs called "hurts"
#tbt alll the way back to last night in the studio with @christianmedice & @mitchycollins a cinnamon treat after finishing a damn good song "take it for what it is"
Hilary attended the Delta Airline Grammy Party on January 23rd, and was interviewed about her upcoming album. She revealed that she was about halfway through the recording process. She also described the sound of the album as being lyrically driven and having an indie pop vibe. At the Clive Davis Pre-Grammy Gala event on January 24th, Hilary talked about her album further. She said it was “straightforward pop” but that it has a bit of an EDM influence, in addition to its earthy indie vibe. Hilary remained quiet for much of next couple of months. Her TV series, Younger, was announced, but she still found time to record music when she wasn’t filming the show’s pilot episode. Shooting promo for #younger today…. Then back to the studio! She did not reveal what record label she has signed with or any other details about the deal. That same day, a new song was registered on ASCAP. “Snow Globe” was written by Hilary Duff, along with Mitchy Collins, Billy Mann, Christian Medice, and Phoebe Ryan. April marked the 7 year anniversary of Hilary’s previous studio album, Dignity. Hilary commented on the special day, and revealed that her new album can be consider “phase 2” of that prior release. can't believe this is the 7th anni of my album Dignity.Thanks for the way you all embraced and supported this record!here comes phase 2!! Hilary shared a picture on April 25th of what appears to be a photo session. It is speculated that this may be for her upcoming album or first single, though there is no confirmation of this. It feels good to be in the studio. It feels good to be talking about my last few years — the high points and the low points. I really just want to be honest and be an open book for my fans to know where I’ve been and what I’ve been doing, how I feel and all that good stuff. There is still much to be announced – the record label, release dates, album title, the track list – and the news only just around the corner. On May 12th, another song was registered on ASCAP. It is called “This Heart,” and was written by Hilary Duff, Toby Gad, and Lindy Robbins. A couple days later, on May 14th, Hilary was in the studio with Ed Sheeran recording the new song he wrote for her. In an interview with MTV at Wango Tango, Ed Sheeran described the style of the new song as “acoustic,” much like his own music. The Hilary Duff song, it’s a really good song. It’s like my sound, I guess. But that isn’t really my sound. Anyone who uses an acoustic guitar is that. That’s not my sound. It’s everyone’s sound. The very next morning, Hilary was back at work again. She posted a new picture on Instagram of her with producer Jerrod Bettis and producer/songwriter Sean Douglas. They are writing a new song which may appear on her record. On May 19th, another new song title appeared on ASCAP. “Wild Night Out” was also written by Hilary, Toby, and Lindy, and also lists Hilary as a performer – this indicates that the song has been recorded. On May 27th, Hilary posted a short note on Instagram that could be lyrics. She has not confirmed this, but fans speculate the lines may come from a new song she wrote. On June 9th, another new song title was registered on ASCAP. This one is called “It All Starts Tonight,” and was written by Hilary, Toby Gad, and Wayne Hector. First Single Info: Is It Ed Sheeran’s Song? We already know that Hilary recorded a song composed by Ed Sheeran. But in mid June, Ed Sheeran revealed a lot of new information about Hilary’s next album in an interview with Digital Spy. It sounds like Hilary’s new record will be pretty different from what she’s done in the past. Going in a more mature, indie alternative direction could be a great stylistic choice for Hilary. Ed later admitted that the he hadn’t heard any of Hilary’s other songs, and was only talking about the one he wrote. Still, having at least one adult alternative acoustic song will be a great inclusion for Hilary’s album. On June 26th, Hilary shared a preview of one of her new songs! Behind the funky strumming guitar riff, you can hear Hilary’s vocals. On July 1st, Hilary started the first day of her album photo shoot! Hilary Duff teamed up with Harper Smith Photography to shoot photos for her new album. This is usually one of the last steps taken before records are released. Nothing like a hands-on producer…@lindsayregan8. First day back on set post-surgery shooting for the new @hilaryduff album. #momjeans #levis #hilaryduff thanks for the great shot @danielkincaidphotography! We’re getting really close to hearing her new single now! Hilary Duff just shot the music video for her comeback single July 10th and 11th in Malibu. The video takes place on a beach and features Hilary, in a black bathing suit, along with what appears to be a love interest. Based on some good fan research, it is speculated the the music video director is Declan Whitebloom. Hilary just started following him on Instagram, making it very likely that he’s directing her new music video. He has worked with artists such as Taylor Swift and Demi Lovato in the past. Based on the usual timeframe between an artist filming a video and it being released to the public, Hilary’s lead single and music video should be out around 3 to 4 weeks from now. More time than that is rarely needed, although it is possible depending on effects added to the video in pos-production. In other words, fans should be hearing Hilary’s new single very soon! Probably around the end of July to early August we will all be playing her new song on repeat, and not much after the video should be out for all of our viewing pleasure. Announcing the New Single: Chasing The Sun! On July 18th, Hilary’s new single was announced in a sneaky, unusual way: A nightclub in New York City called the Marquee suddenly revealed that they would be premiering Hilary’s single at a re-opening even on Thursday, July 24th. Fans were excited, but the news was still unconfirmed. On July 23d, everything about Hilary’s new single was confirmed! It’s called “Chasing The Sun,” it was being released on iTunes on July 29th via RCA Records – same day as the new music video! – and we could see the single cover art. Before they played the remix of “Chasing The Sun,” Hilary also spoke a bit about her new album and plans for a tour. You can head over to the Marquee’s tumblr to see a video of her quick interview. On July 24th, Hilary Duff called up Pop Justice for an exclusive interview about her new music – she went in depth describing her new music, plans to leak her leftover songs, and why she took a 7-year break from the pop world. It was posted online on Friday the 25th. The single leaked on Monday July 28th, but was officially out right on time at midnight on the 29th. So far, the single has gone into the Top 20 on iTunes; the video has over 19 million views. It’s great to see how successful Hilary’s music is, even after such a long hiatus! In late July, Hilary Duff stopped by Billboard for a quick interview about her upcoming 4th album. She talked about why she took such a long break from the pop world, what got her back into music, and how the new songs turned out. At the beginning of August 2014, another 3 song were registered on ASCAP. All three were written by Hilary Duff, Toby Gad, and Wayne Hector – they worked together earlier in 2014 and already have a few songs registered on ASCAP. The trio also wrote “It All Starts Tonight” and a song called “If I Fall,”which Hilary talked about in a recent interview. With these 3 new titles, we now have more than 20 songs that could appear on Hilary’s new album! Some of the earlier songs, such as “Breathing Room” and “Outlaw,” may not make the track list – her earlier, heavy EDM songs have all been scrapped. Instead, she’s using her folky and indie songs that she wrote and recorded more recently. “All About You” – Another Single Already! This weekend is going to be All About You guys…! On August 12th, “All About You” was made available on iTunes and was put up on YouTube. It’s an uptempo piece of pop perfection, combining a folky sound (think The Lumineers or Imagine Dragons) with big pop hooks a la Avril Lavigne. You love it, right? Whereas “Chasing The Sun” was a mellow summer song courtesy of Colbie Caillat, “All About You” is upbeat, fun, and full of cheerful little heys. The folky strumming guitar and big drum sounds are complimented by Hilary’s high pop vocals. She sings of love between two people who “can’t stay away from each other, and kind of are electric when they’re together.” It’s a great love song that’s sure to stay on repeat for the foreseeable future. “All About You” was written by Hilary Duff, Savan Kotecha, Kristian Lundin, and Carl Falk. It will act as the first proper single from Hilary’s upcoming album; as it turns out, “Chasing The Sun” was just a buzz single for fans to enjoy. 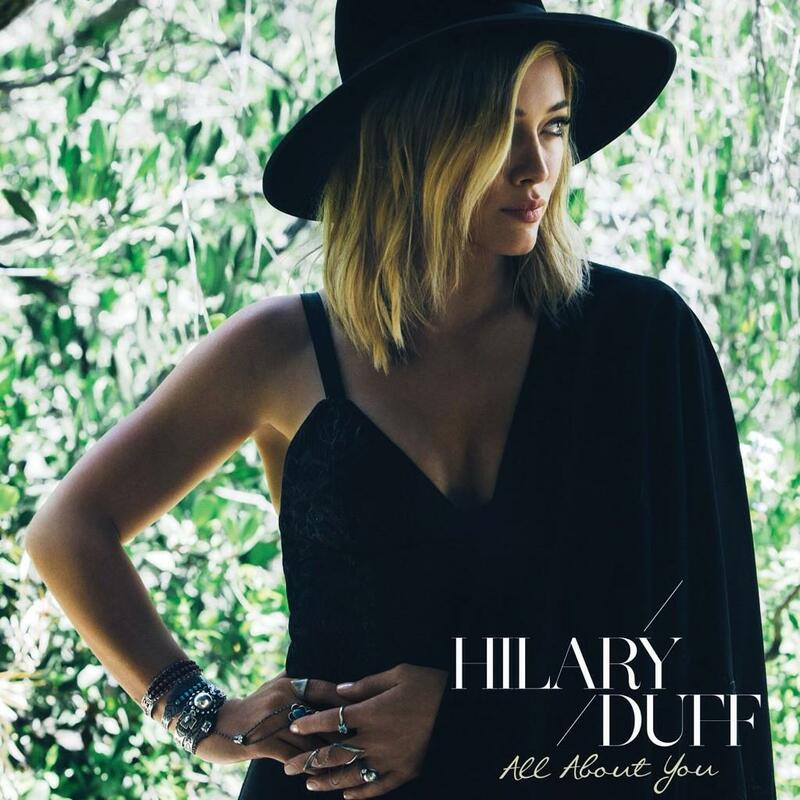 Hilary Duff finally released a music video for the infectious pop single “All About You” on September 25, 2014. As promised, the video features line dancing in between Hilary’s mission to find her new crush. “All About You” is a perfect pop song, and the video matches its quality. Who doesn’t love a good love story? Bonus points for incorporating a vinyl record for this musical love interest. Hilary also look s great herself, and her line dancing is amazing. It’s a great way to play up the country undertones and strumming banjo in the song. I think probably not as soon as I thought, but yeah! That’s the ultimate for me, wanting to be back onstage again. Working on the show, I work so much, and I’m based in LA, so it’s kind of just got me all out of sorts, but in a good way. So I’m just re-evaluating timelines and what’s realistic — proper rehearsal times, and actually finishing the record and what a tour would look like for me. I’m trying to figure that all out right now. And when would the new album be out? I think in a few months! Another new song was registered on HFA. 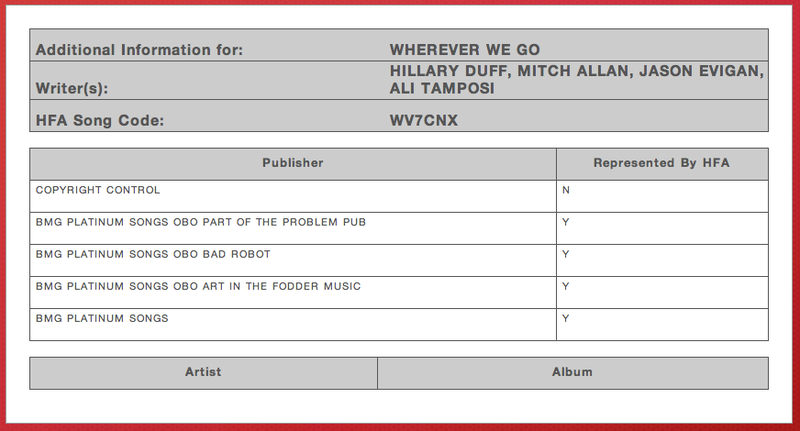 “Wherever We Go” was written by Hilary, Ali Tamposi, Mitch Allan, and Jason Evigan. After months of near silence about her music, Hilary evidently was not done working on it yet. In January 2015, she just flew all the way to Sweden to craft some more songs! And she happened to have a rising star and accomplished writer with her: Tove Lo was helping Hilary write some new songs! Wolf Cousins, referenced in the second Instagram photo, is a production team consisting of Tove Lo, Max Martin, Shellback, and a handful of other producers. That’s a great team for Hilary to be working with! Interview With Time: Album Is Done! Notice that she promises a new single “soon”! The next day, we get a clip of her new single. “Sparks” sounded like exactly the pop gem that fans have been hoping for. It’s only a one minute snippet, but we already loved this new direction! “Sparks” was co-written by new hit-maker Tove Lo, and produced by Bloodshy and Peter Thomas, and it will be the new single from Hilary’s upcoming comeback album. While the first two singles – 2014’s “Chasing The Sun” and “All About You” – had a laid-back, folk-pop sound, “Sparks” goes more in the direction of Hilary’s last studio album, Dignity. Released in April 2007, Dignity had a slick dance-pop sound that was just ahead of its time. “Sparks” is a welcome return to that style, but with a modern update. And there’s more where that came from: Hilary told Time that her new record features plenty of electro-pop and dance-influenced pop, in addition to a few of her folky songs from last year. The preview of “Sparks” in the video below doubles as an advertisement for Hilary’s new TV show, Younger. The comedy drama series was set to officially premiere on March 31st, and stars Hilary as Kelsey, a smart but wild young woman working in a publishing firm. Younger has already gotten great reviews from early viewers. On April 7th, “Sparks” was officially released to iTunes around the world. It harkens back to Hilary’s Dignity days, and is a great new single to hype up her forthcoming album. In April 2015, Hilary mentioned a track on her album called “This Heart.” The song had been registered on ASCAP in May 2014, and a full year later Hilary revealed that the song is about her son Luca. “This Heart” will be on her new album, slated for a summer release. Hilary also had an interview with Mario Lopez on April 8th. She spoke about the album and revealed a new song title: “One In A Million” was co-written by Tove Lo during their Sweden sessions in early 2015. Album Up For Pre-Order & Set For June Release! On May 5th, Hilary announced that her album was available for pre-order and would be coming out soon. Fans that pre-ordered the album in time would get their names printed in the booklet of the special fan edition of her album. Hilary has since confirmed that the album will be out sooner than we may have thought – June! She promised more details – like confirmed album title, cover art, and track list – in the following weeks. You can pre-order Hilary’s new album on MyPlay now. Announcing Breathe In. Breathe Out. On May 14th, Hilary Duff announced her new album title, confirmed the release date, and revealed the cover art! Breathe In. Breathe Out. will be released on June 16th! While the full track listing has not yet been confirmed, we do know that at least “All About You,” “Sparks,” and “This Heart” will appear on the album. The same day that Hilary announced her album title, she also dropped the music video for her latest single, “Sparks.” Most of the scenes are full of bright, sugary colors as Hilary and same dancers sway to the music. These polished, fun scenes are interspersed with lots of recent interviews and real footage of Hilary on Tinder dates. Unfortunately, the video ended up being rather distracting from the actual song. Much of the song was cut out as interviews and footage audio took center stage. The video was awkward, but the colorful scenes helped make up for it. On May 19th, a new episode of Younger aired, and this one was extra special: It included a 30 second snippet of a new Hilary Duff song! We don’t know what the title of the song is, but we should find out soon. It is possible that it will be on Hilary’s new album, Breathe In. Breathe Out. On May 28th, Hilary gave fans exactly what they asked for: A better, Tinder-less version of her “Sparks” music video! The new video contained no interviews, no Tinder footage, and nothing to distract from the song. Instead, it was pure colorful fun and vibrance. The new video included only scenes that were filmed in the studio, with Hilary dancing along with her entourage to peppy music. It was a huge improvement upon the original version. May 28 was full of excitement: In addition to the new and improved “Sparks” music video, fans also finally got the full, confirmed track listing for Breathe In. Breathe Out. A few of those song titles we already knew about. “Tattoo” was written by Ed Sheeran, and Hilary was excited to record it with him last year. “Night Like This” is another song that Hilary was working on in spring 2014; at the time she was trying to find a good male duet partner. “Brave Heart” was recorded last summer and was registered on Harry Fox Agency in October. “One In A Million” and “Stay In Love” are two songs Hilary recorded in Sweden. She was working with Tove Lo and Michael Angelo; this is also when she recorded lead single “Sparks.” The bonus tracks on the Australian edition include “Belong” and “Rebel Hearts.” Hilary described the former in a Huffington Post interview last fall; the latter was registered on HFA in December 2014. The rest of the song titles are new. The first 12 confirmed songs are just from the standard edition of Breathe In. Breathe Out. There will be a deluxe edition with 2 bonus tracks, a Fan version from MyPlay with bonus tracks, and a Fanjoy version with 4 bonus tracks. (There may also be other bonus tracks with other versions of the album from iTunes, Target, or Best Buy; these retailers have not yet announced if they release special editions of Breathe In. Breathe Out.) It is likely that the two Australian tracks, “Belong” and “Rebel Hearts,” will appear as bonus tracks. Stay tuned for confirmation as to what the bonus tracks are. Two surprising exclusions are last year’s singles “Chasing The Sun” and “All About You.” Apparently the change in style left these two singles a little out of place on the new album. Hilary switched gears from a folk-pop sound (heard on “Chasing The Sun” and “All About You”) to one more dance-pop and reminiscent of 2007’s Dignity. Hilary recorded many songs over the last two years, and surprisingly, most of the titles we knew about ended up not making the record. You can go to the list of known song titles to see the over two dozen leftover songs; perhaps some of these will be bonus tracks? We still hope to hear “Outlaw,” “Belong,” and “Northern Star” some day! In episode 9 of Hilary’s new TV series, Younger, one of her new songs can be heard. Fans have been buzzing about what it could be. Now we know it’s “Outlaw,” a song Hilary worked on early in the recording process. She did the song in fall 2013. Hilary’s Younger character, Kelsey, is a little bit wild. According to Hilary, “My Kind” and “Night Like This” (which features Kendall Schmidt) would fit Kelsey pretty well. These sound like fun songs! In the days leading up to the album’s release, Hilary released brief snippets of some of the songs on Breathe In. Breathe Out, including Clips of “One In A Million,” “Confetti,” and “My Kind.” On June 9th, Hilary also confirmed that “Outlaw” WOULD in fact be released! It was one of the bonus tracks in the Fanjoy box set. Finally the big day arrived: On June 16th, Breathe In. Breathe Out. came out, claiming a top 5 position in the Billboard 200 album chart for its first week. It was Hilary’s first studio album in 8 years, but it was worth the long wait, patience, and dedication. Hilary showed that her writing and singing had both improved, and Breathe In. Breathe Out. can rival Dignity as Hilary’s best release to date. Songs like “Tattoo” show off Hilary’s impressive vocals, while songs like “Picture This” and “Night Like This” lend a quirkier vibe to Hilary’s catalog. “Lies,” “Breathe In. Breathe Out.,” “Outlaw,” and “Stay In Love” are among the album’s highlights, though every song is strong. Hilary’s overdue return to pop was better than we could have imagined, and hopefully it won’t be nearly so long before Hilary releases her next album. Read our Breathe In. Breathe Out. review for more. Apparently, the album’s official name, as announced by Hilary and RCA, is “This Heart”. Thanks for the heads up! We’ve updated the page with the new “This Heart” information. Can’t wait until the album comes out! Amanda, where did you find out about “One in a Million”? I can’t find that info anywhere. I checked ASCAP and found nothing. Do you have a link? Love the title too – now we have at least 3 songs confirmed!